Horizon presents the project for the E54 a flybridge motor yacht which use the Volvo IPS propulsion, this giving more an eco-friendly design and a greater interior volume for a comfortable and efficient ride. Styling for this new entry level is by US designer JC Espinosa who created a streamlined profile, accentuated by large E-glass windows and an oversize windshield for enhanced natural light, increased visibility, and panoramic views. 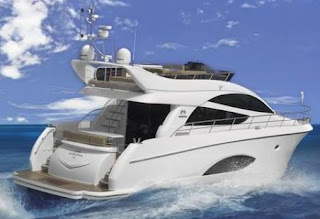 Inside the E54 will offer a three stateroom, two head layout comparable to a much larger yacht, with thoughtfully-designed accommodations that maximize space while retaining an open feel. The IPS drive’s aft location provides increased interior volume, allowing a full-beam master with a walk-in closet, master head and room to spare for either a desk or seating. A guest stateroom with twin bunks is forward and to starboard, with a shared head to port and the highly spacious VIP cabin completely forward. For entertaining with a view, the E54 flybridge features sun pads and alfresco dining for eight, and a newly designed helm station with dynamic positioning system made to make docking easier. The aft deck seating area contains dining for six, with the option for an aft galley location that provides easy access to the aft deck, and a hydraulic hi/lo swim platform and transom trunk storage proves ideal for a multitude of water sport activities. Twin Volvo IPS900 with 700hp should give a top speed of 34 knots and a cruise of 28.